Concept Maps; Social Network Analysis!! May-June interns completed Network Analysis of Ning growth from 2007-2012. See report. Information visualization is a growing area of knowledge management. The Tutor/Mentor Connection has been piloting the use of a Geographic Information System (GIS) to visualize information since 1993. In the links below we demonstrate a use of Concept Maps to diagram, or blueprint, the goals of the Tutor/Mentor Connection and organization of information . Active Tutor/Mentor Institute SNA and Visualization Projects !!! network map - this could work just like the skills map, but would show the range of organizations we're connected to and how this has grown over many years. This SNA report shows growth of http://tutormentorconnection.ning.com group from 3 members in 2007 to 412 in May 2012. 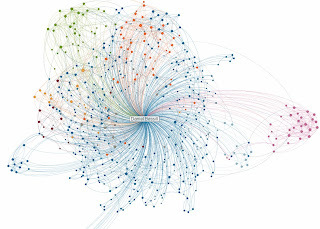 It's an example of how SNA might be used to show network growth. With more than 100 volunteers working in dozens of different projects, I need some tool to show progress toward goals, and to identify who is working on what project, at what time. In some ways, this wiki is intended to do that. Any volunteer working on a project can log in and add their name showing what project they are working on, and/or adding a new project not listed. However, this is not a "visual" tool. I was watching the movie Pear Harbor last night, and there was a scene where the movement of Japanese ships across the ocean, toward Pearl Harbor was shown. I've seen similar uses of troop movement maps, in other war movies. I'm looking to duplicate this process on line, to show how all of the different projects and volunteers are helping us move toward one goal. If anyone can help on this, I'd like to hear from you. I created this talent map to show the range of talents I'm trying to bring together and to show some people I'm connecting with. A map like this could be a useful tool for any organization and Social Network Analysis, SNA, mapping tools could be used in conjunction with the tools that create Google Maps, to enable people to add themselves to the talent map and the Google map. Thus, we could see what talent they offer, as well as where they are located. Using this information to build a team…and to demonstrate to investors and donors who is working together, could be of value to many. This video illustrates how networks can be mapped to show the growth of the network and the clusters of networks connected to each other in a constellation of networks. I want to be able to do this. This skills map is a recent example that I've created to show the range of talents needed in the network and to identify some of the groups and people I'm connecting with. SNA to show growth of network over past 20-30 years and to show who is currently active in support of T/MC goals. As of July 2011 the Tutor/Mentor Connection is no longer part of the Cabrini Connections non profit structure. Dan Bassill, founder and CEO of CC, T/MC in 1992 is creating a new org structure to support growth of T/MC in Chicago and similar structures in other cities. This will be called Tutor/Mentor Institute, LLC and will build on the ideas shown at http://www.tutormentorexchange.net Many people have been helping Dan think through the new structure and more will be willing to continue to support the growth of the T/MC and tutor/mentor programs in Chicago. However, no Network Analysis tool exists to show who all is working with Dan, what role they are taking, what level of commitment they have, etc. Creating such a tool and mapping the growth of T/MC since pre 1990 will be one goal of the Tutor/Mentor Institute and partners. Visit this section on the Ning site to see ideas about mapping network changes over time to demonstrate impact of a tutor/mentor program on youth and volunteers. If we can show change in a youth network caused by the tutor/mentor program introducing the youth to new volunteers and ideas that are not frequently modeled in a youth's neighborhood we can demonstrate a that the program is a form of "bridging social capital" and attract donors who value this. If we can demonstrate that employee involvement in a tutor/mentor program expands the informal network for that employee, we can provide reasons a business will support volunteer involvement and the tutor/mentor programs where volunteers are engaged, for the workforce development goals of the business. Read more.